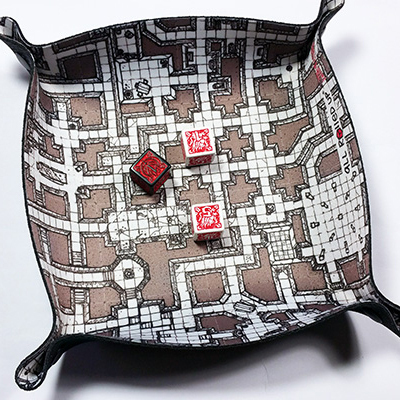 Our new range of SQUARE neoprene dice trays – 200mm to a side, with the same flexibility and fold – now populate the Accessory section of the web store. All the same designs as the COMPACT range, with a couple of minor colour variations. We designed the Compact neoprene Dice Trays with the wargamer in mind or the board game player. We wanted something you could use to manage your dice rolls with space at a premium. These are the compact range and run 190mm x 167mm. The new Square neoprene Dice Trays come in at 200mm square, which more or less matches the size of the wool felt design (which run ever so slightly larger on average by a scant few millimetres). They all fit inside your All Rolled Up – so, no worries which you choose for what gaming occasion! We want to offer choice to every sort of gamer – and the non-gamers too who use our dice trays to wrangle all sorts of other possessions and knickknacks! All in-stock at the moment, while those stocks last, in the Accessory section. All the standard caveats around Christmas post.